Let’s face it. If you’re creating a social media strategy that includes Instagram, you are going to have to think about what it takes to acquire more followers. Have you ever wondered how the big influencers stack their accounts? If you are looking to get more followers, the right way (we’ll explain), then this post is for you. I’ve done some digging around, talked to our clients that are killing it on Instagram and pulled together the best pieces of advice on how to get more followers on Instagram. Before we delve into the social media strategies that will help you grow your Instagram account, let’s talk about some best practices for growing your Instagram account. Before you do anything to grow your Instagram account, you need to understand some basic principles of what makes a successful, thriving account and what doesn’t. The types of followers you have does matter, especially when you want to use Instagram as a distribution channel for your company, or monetize this social media channel in some way. The accounts that know how to get engaged, real followers are the ones with the most long-term (and quite frankly, short-term) success. We get asked this question all the time here at Crowdbabble and it’s important. Fake followers still exist on Instagram, and other social media platforms, but they usually don’t help you grow your business, or monetize your channel in any real way. In fact, if you don’t remove your fake followers, it could harm your relationship with your true audience! Fake followers are usually those Instagram accounts that have one or two posts, follow thousands of accounts, but don’t have any followers themselves. They are created for the sole purpose of ‘faking’ the followers and bloating up numbers. Often, they are actually bots. These bad bots, the ones that want to steal your password or infect you with a virus, account for 28.9 percent of bots on Instagram, according to data security company Imperva. If your Instagram is public, meaning anyone can view your pictures, the risk of bots following you, messaging you, and stealing your photos is increased. We strongly recommend that you purge your Instagram account of bots, fake followers, and those who could harm your efforts in the long-term. It might seem like a good idea to pump up those numbers while you are building an audience, but really, if you have to close your Instagram account one day because of a phishing scam, or data security issue, will it be worth it. Our advice at Crowdbabble has always been to avoid buying followers. Building a social media channel isn’t easy. It takes effort, strategy, real engagement with your audience — there are no shortcuts. If you want to take the ‘easy’ way to build an Instagram account, it will cost you. How to become more popular on Instagram. In the noisy and hyper-competitive world of Instagram, you have to be creative to stand out and make a lasting impression. This means your biggest challenge is… being creative ALL the time! That’s why I’m here to share a secret with you. The most successful Instagram accounts don’t just create – they spy. They pay close attention to their competitors and go against the grain. They look for ways to keep their audience engaged with great content while targeting new followers to grow their Instagram account. They build genuine connections with their audience and build a loyal following that steadily continues to grow. Like I said before, there are no easy ways to building a strong, loyal Instagram following, but there are some hacks, strategies, and tips that I can impart to you now that really work. 1. Figure out who your audience is first. Before you decide to grow your Instagram account, you are going to have to take the time to really dig deep into your audience persona. Ask yourself, who is your target audience person — figure out their likes, their dislikes, what they like to do on the weekend, their values, personal opinions, etc. You can discover these audience qualities either from polling your current audience, or doing some market research on new audience sectors, depending on where you are in your business. Knowing exactly who your audience member is, where they hang out, what they like, more importantly, what they share with their friends is key to your long-term social media success. Started by three friends in their college apartment, the Betches brand has become more than just a hilarious slice of life targeted millennial women. The story of organic, authentic growth of the Betches brand is one we should all pay attention to — why? Because they knew who their target audience member was. From day one, they curated and created posts that would speak to their ‘betch’. As you can see, they still do. 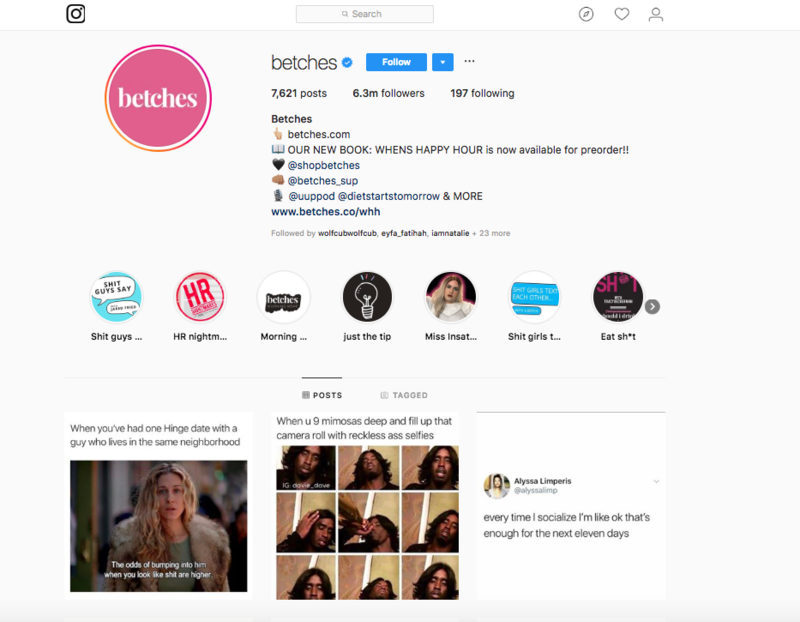 Not only does Betches have a lot of followers, they have the right kind of followers to grow their company. If you are going to speak directly to disgruntled, millennial women who are tired of the ‘bro-mentality’, then you wouldn’t want to post pictures of women in bikinis (unless it was ironic). Know your target audience and speak directly to them, just as you were sitting across the table from them at lunch. Content is the most important aspect of growing your Instagram account so you need to make sure you have a grasp on what your followers and the larger Instagram community in your niche engage with. Start by doing a deep dive into the content of 3 competing Instagram accounts. They don’t have to be direct competitors with you either, but they should all be attracting the same audience. Analyze one account that is about your size, one slightly bigger and one that is much larger. This will give you insight into what content is working and help you develop your own Instagram voice that you can be confident will work. You can do your first competitive analysis using Crowdbabble to export historical data back to January of 2016. With a few clicks you can easily sort through two years worth of posts and identify your competition’s best posts to uncover how to get more followers on Instagram. What you’ll want to do next is analyze these top posts and take the aspects you like from all three competitors to help craft your own style and content strategy going forward. Just make sure you’re consistent so you can develop a stable voice for your brand that always resonates with your audience. Crowdbabble also offers the ability to analyze your competition’s most engaging hashtags that resonate with the audience you’re trying to target. Mixing in some of these smaller niche hashtags with some of the larger ones will help you earn some quick likes and get more followers on your Instagram account. Crowdbabble Instagram analytics also offer you insights into your audience that you don’t get anywhere else. With our proven insights and dashboard, you can track and monitor the most relevant Instagram data and metrics (such as engagement) that you’ll need to continue to grow your followers. 3. Know your hashtags — yours and your competitions. 4. Remember Instagram is a social platform. We all love scrolling past images of food, people on their travels, or scenic tours through Europe, but Instagram is more than just fun posts, videos and images — it’s also a social platform. Thinking about what your audience actually use Instagram for is a big step in building a loyal audience. Are your followers going to be able to really engage with your posts? Do you ask them to tag a friend who would like this? Are you inspiring shares? Do you encourage shoutouts from others in your industry? All of these things, over time, can add up to a more engaged audience. Remember too, that your members are there to take a break from their lives, to be inspired, to be moved, to laugh. The most successful Instagram accounts are the ones that are relatable. 5. Target your competitors’ best followers. Now that you have developed your content strategy and uncovered what is resonating with followers in your niche, it’s time to start engaging with your competition’s best followers. Tough question – who are your best followers? Highly engaged Instagram users that are liking and commenting on multiple posts. Highly influential users that have a large follower base within your niche. By engaging (liking, commenting, following) with your competitors most active and influential Instagram followers you’ll see a large percentage of these followers start following you back, because your contents voice will now be matching their interests. As a result, your Instagram account will get more followers and your engagement rate will increase. These engagements will also be authentic, because you’ll be adding highly engaged Instagram followers instead of bots. Increasing your engagement rate organically will rank you higher in the Instagram algorithm, which means your account will get discovered more and you’ll show up in more feeds – cracking the code of how to get more followers on Instagram. When people come to your little side of the world on Instagram, what do they get? What are they expecting from your brand when they get there? If you’ve already built a loyal following sharing funny cat memes, that’s what they expect to see when they get there. Don’t try to jump into something completely different. What if the brand you’ve built isn’t the brand you want to use to sell customers? Start a new Instagram account. 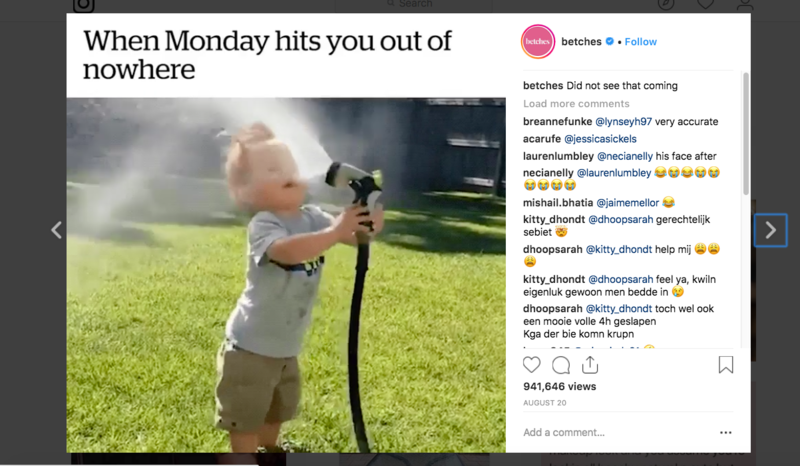 Many brands have used widely popular accounts to branch out into more serious topics, ecommerce plays, and build very successful subsidiary brands. 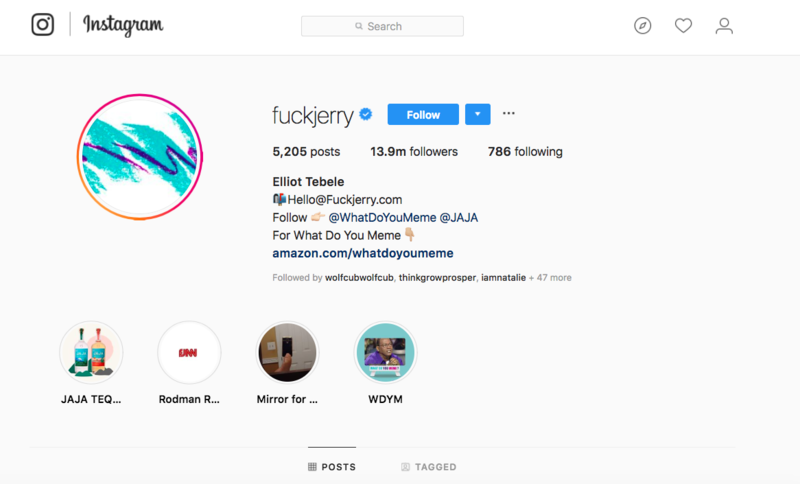 A great example of this is the popular personal Instagram account F**ck Jerry, which morphed into many sub-brands that do quite well and a product line (a board game) called What Do You Meme. Consistency of your brand, of your message is key, but also is consistency in the amount of posts you have. If you’ve been too busy to post on Instagram every day, you are not going to see the kind of engagement you’ll expect. Posting at least once a day, consistently is key. Of course, we don’t want you to sacrifice quality just to be consistent. Consistently bad doesn’t work either. Use high-quality images, tell a compelling brand, and have fun! 7. Find your people. Don’t worry about the others. And, finally, our last piece of strategic advice for you — find your people. Just collecting people and followers on Instagram isn’t going to be enough to propel your brand, image, or business the way you want — you have to find your peeps. Filtering options can help you quickly identify the highly engaged and influential followers engaging with your competition. After optimizing your content to match their interests, start engaging with these followers on a daily basis to grow your Instagram account and leave your competitors in the dust. Executing on this strategy might sound like hard work, however, spending the time farming a highly engaged and influential follower base will set you up for success to get more followers on Instagram. Keep an eye on your competition, but remember the quote from Dave Trott – your creativity is the biggest competitive advantage you have. Remember, you audience wants to engage with high-quality content. Put your best posts out there! Use video that engages your audience and entertains them. Polish up your profile. Get posting. Create engaging stories and have fun. We’ll be seeing you on the ‘gram!